vIf you'd prefer: MY ETSY SHOP - more pictures are available. 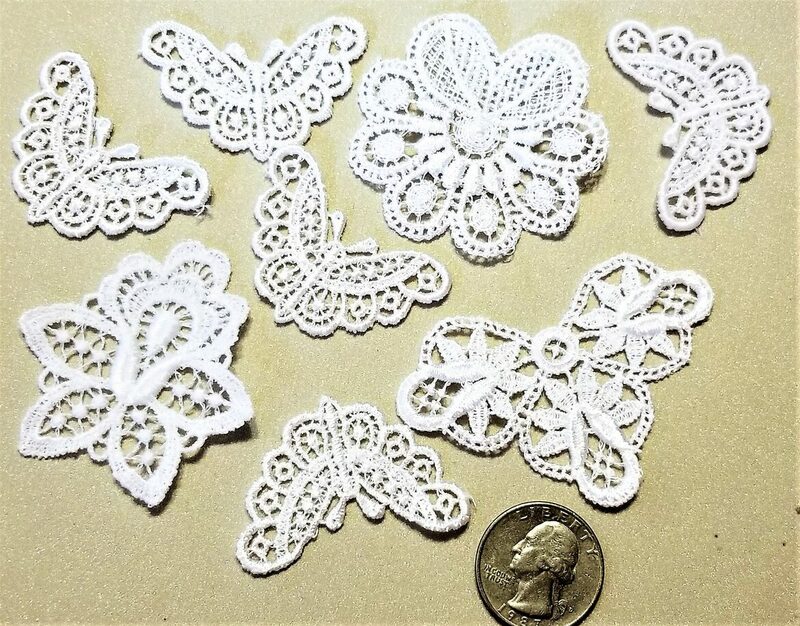 Eight, beautiful, white butterflies and accents of lace and embroidery. 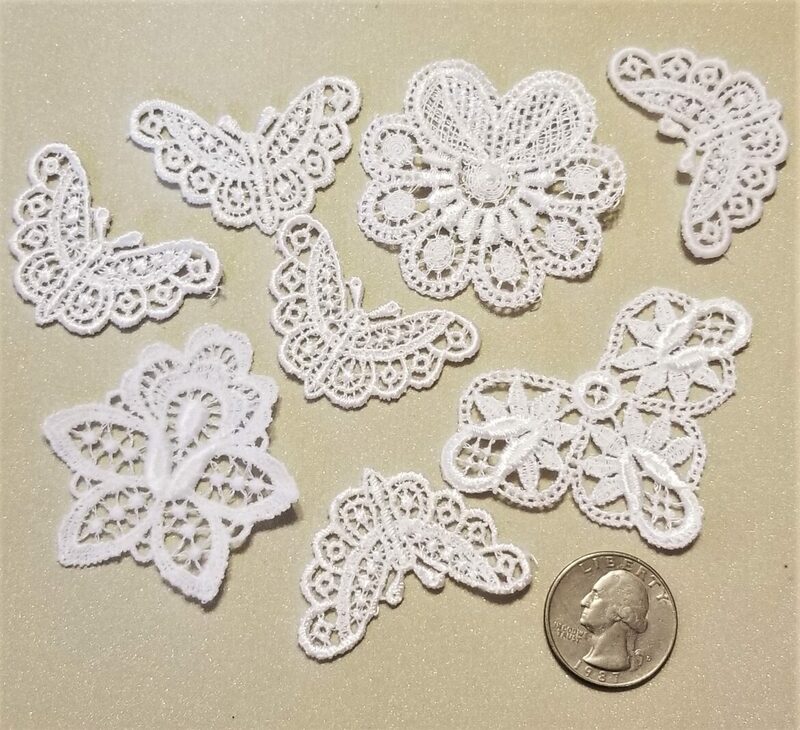 Assorted sizes in length and width. Please check the pictures for size comparison with a quarter. Remember, I only charge on shipping rate of $6.45, no matter how many items are ordered at one time. Thank you. 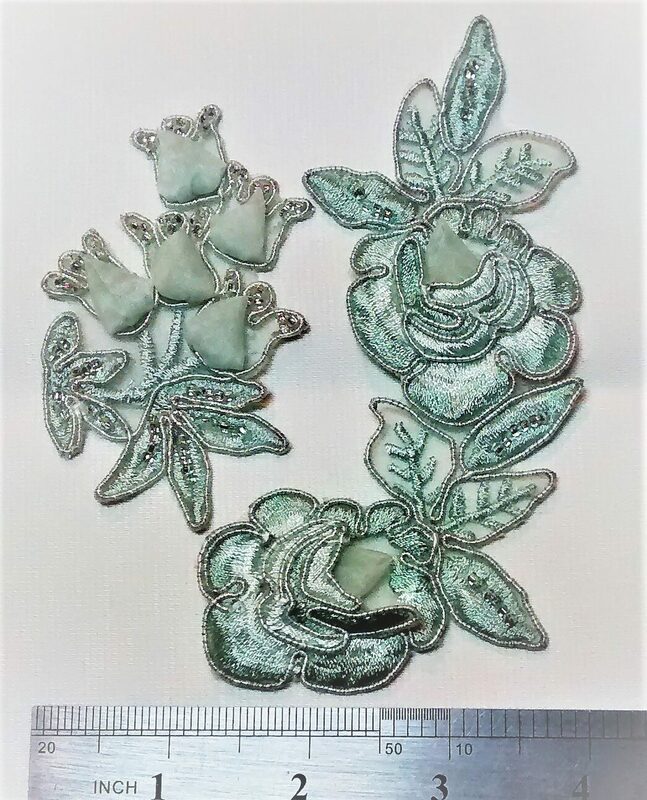 These are pretty, delicate, light, teal, two piece, applique of roses and leaves. It features a 3-D effect. 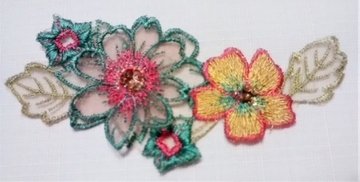 It is enhanced with small seed beads to add sparkle. 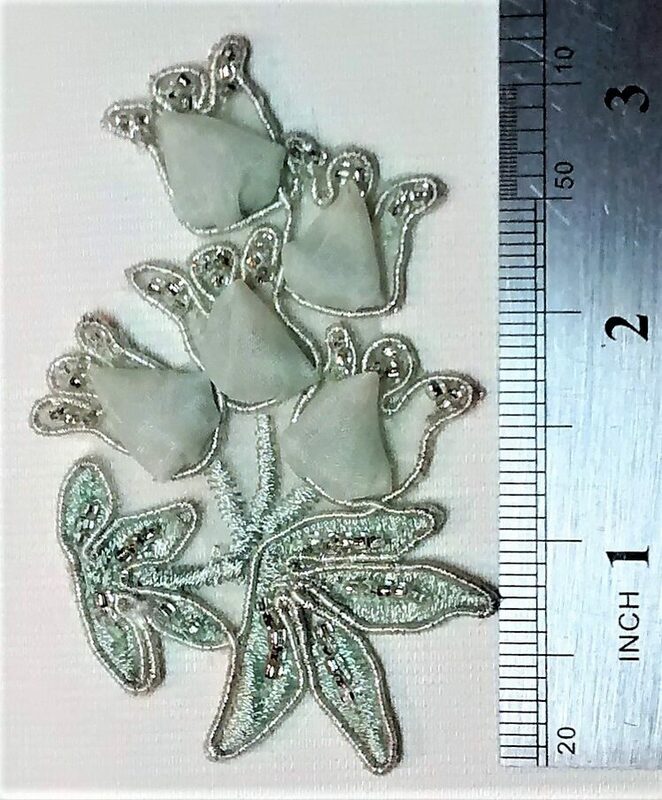 The exact measurements show up in the pictures. 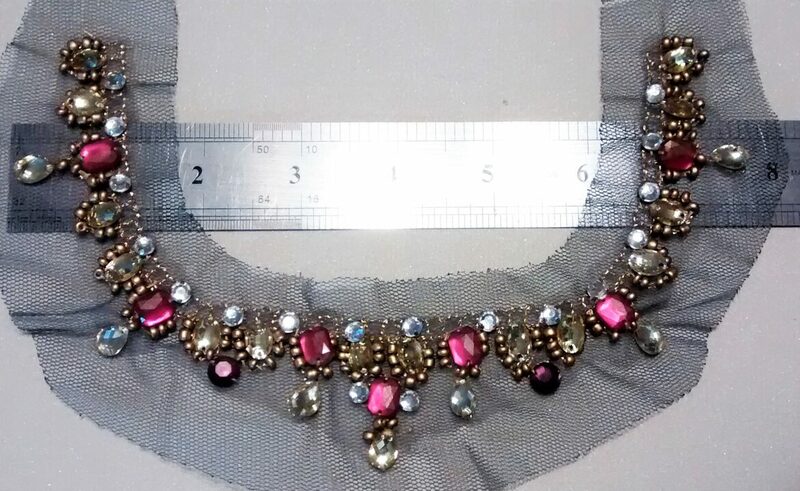 Gorgeous embellishment. 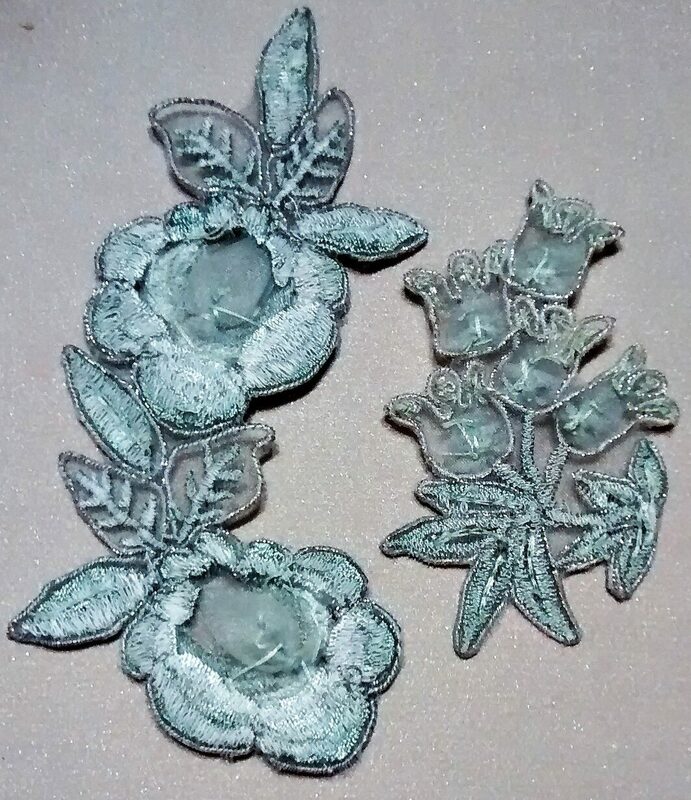 The last picture shows the backs. The first two pictures represent the color that is closer to the original items. 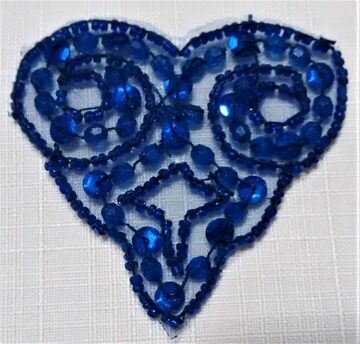 A beautiful applique heart of royal blue. 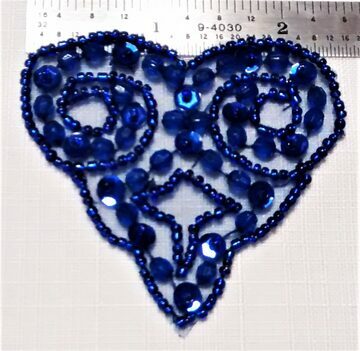 It has blue sequins, seed beads, and small faceted beads. Gorgeous. The last photo shows the back. It is approx. 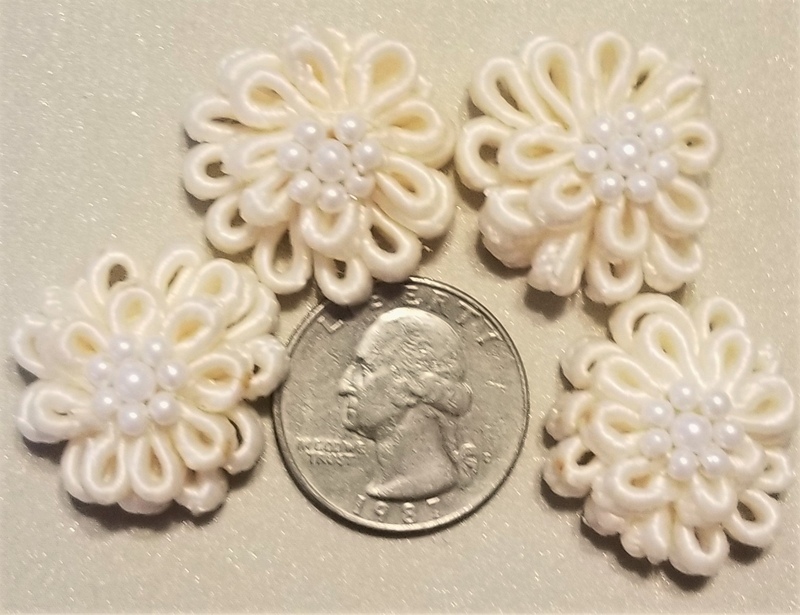 2 1/2 inches in length and 2 1/2 inches in width. 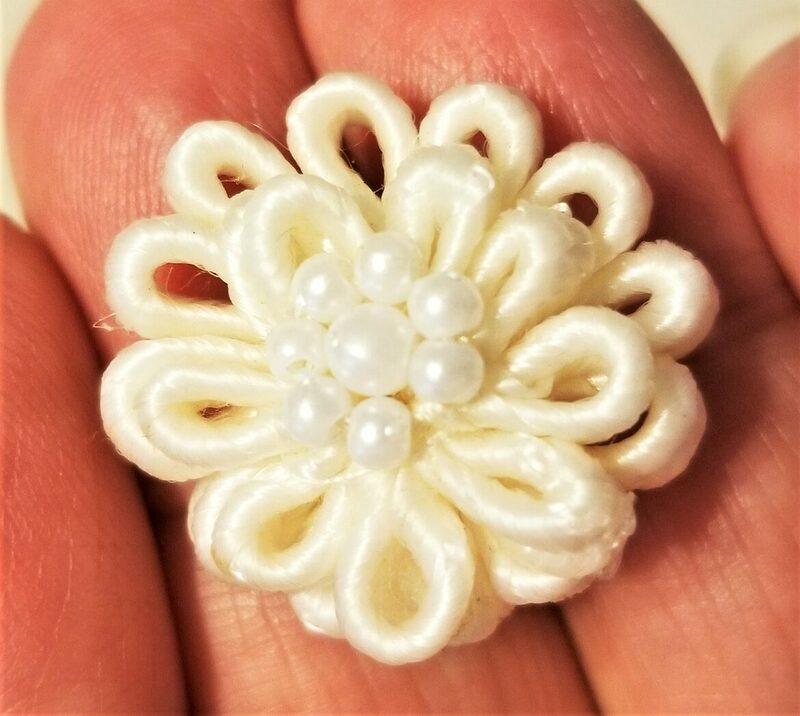 Sweet flowers in a cream color that are accented with pearls in the center. Comes in a pack of four. 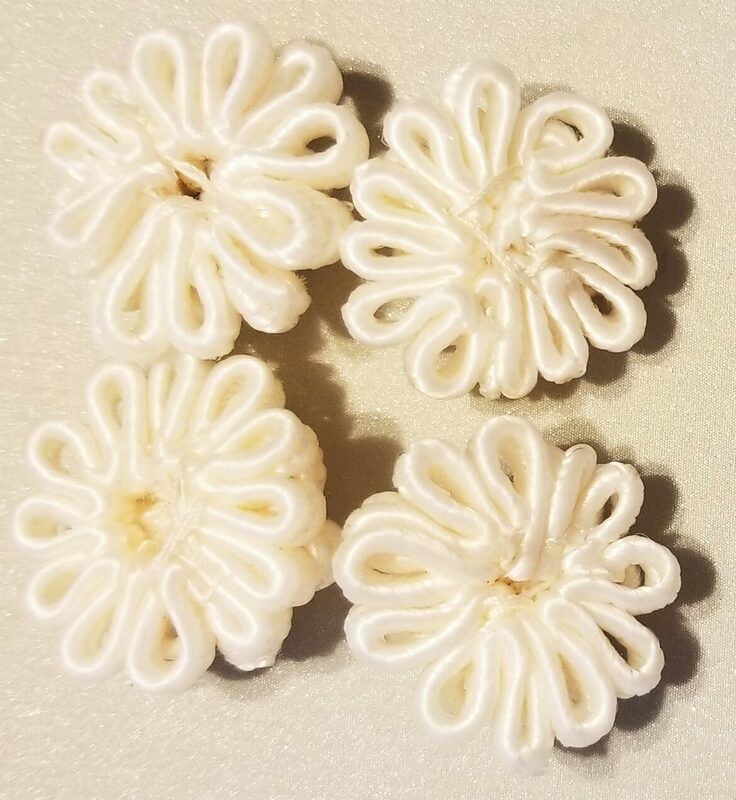 These can be used for so many types of crafts. 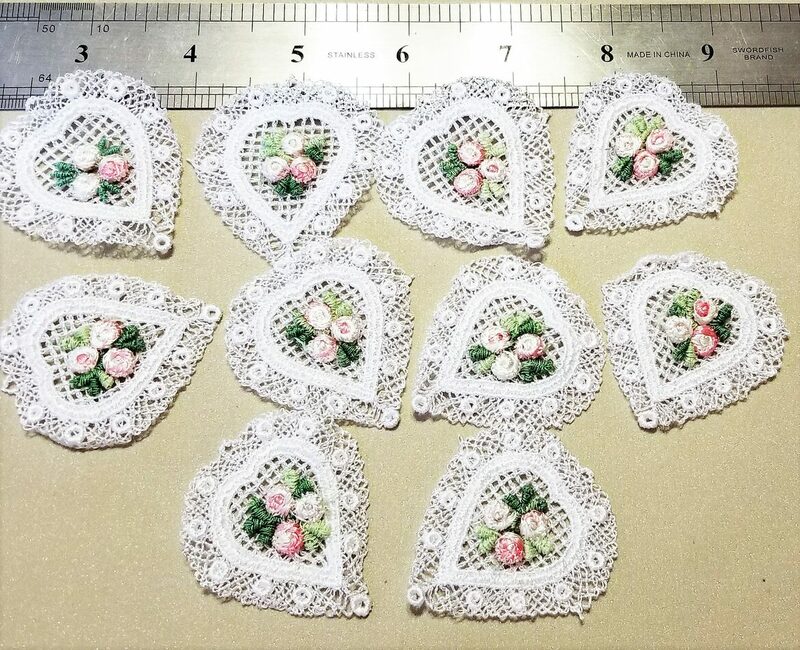 Button covers, jewelry, appliques. 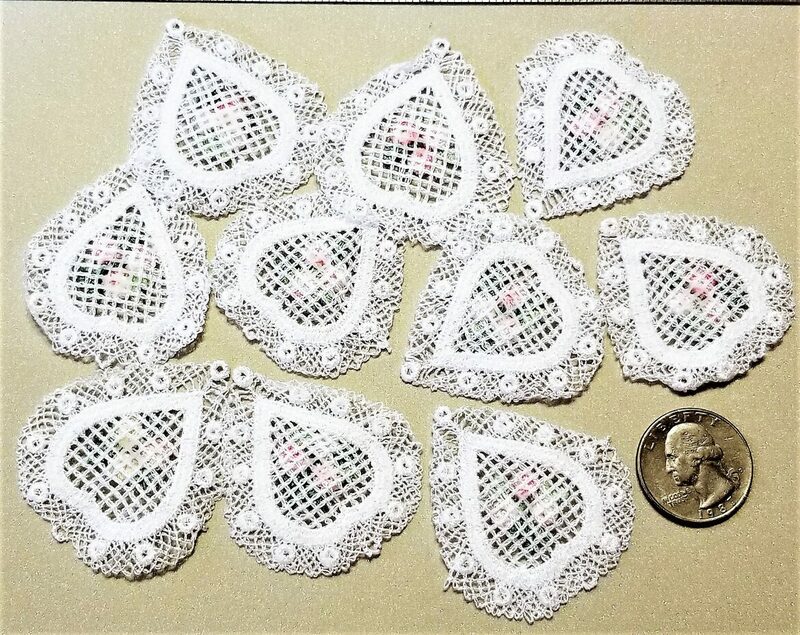 each is one inch in diameter. 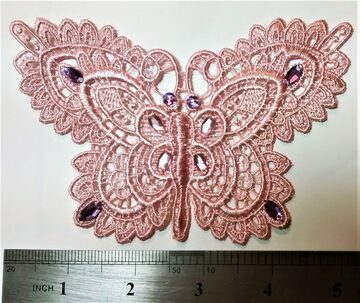 This applique, for crafting, that is enhanced by rose colored and clear rhinestones, accented with clear beads. Very eye catching. 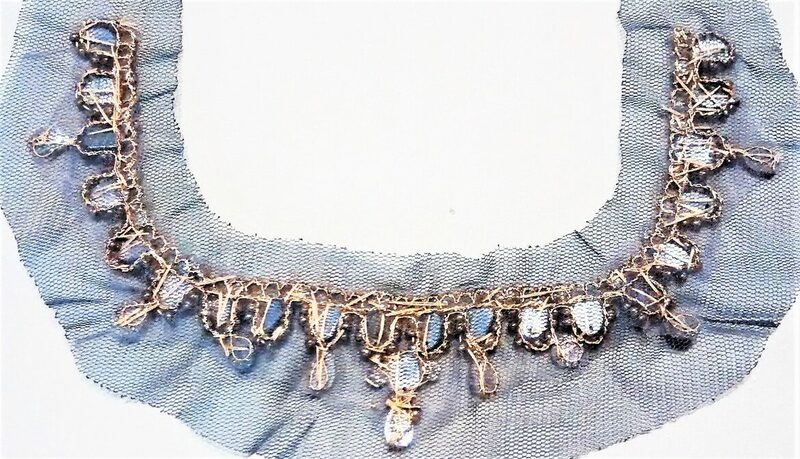 It has a background of netting for attaching to material. The back is shown in the last picture. 8 inches wide and 4 inches deep. 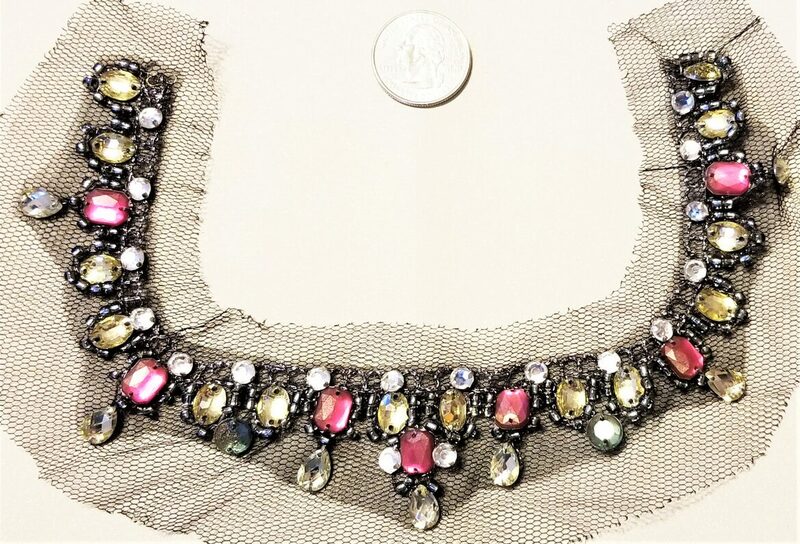 Did I mention that this is one gorgeous piece? 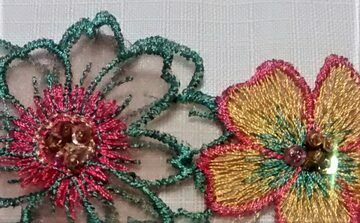 This is a beautiful floral applique of re, green, and yellow embroidery. This is a gorgeous piece. 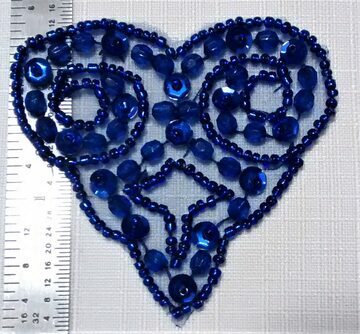 It has several layers that give it a 3-D effect. The last photo shows the back. It is approx. 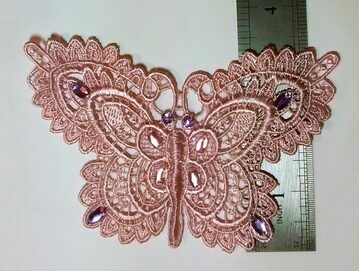 5 1/2 inches in length and 2 1/2 inches in width. 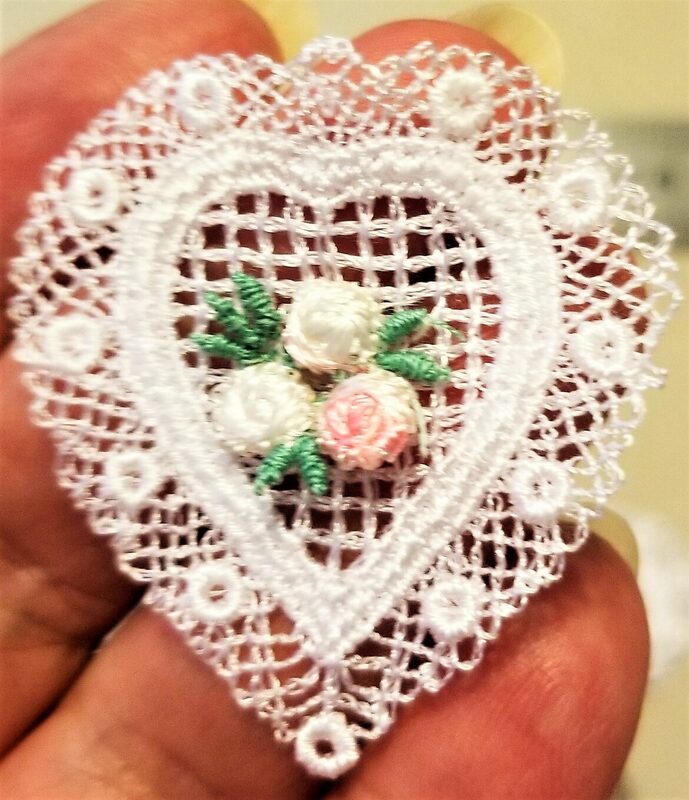 Beautiful, white lace hearts with embroidered pink, green, and white roses in center. 1 3/4 inches in length and 2 inches in width. Ten hearts in a pack. 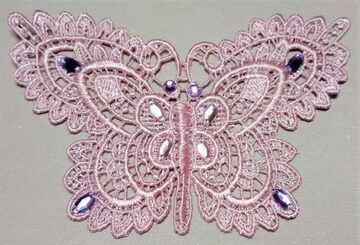 This applique, for crafting, that is enhanced by rose colored and clear rhinestones, with gold thread and beads. Very eye catching. 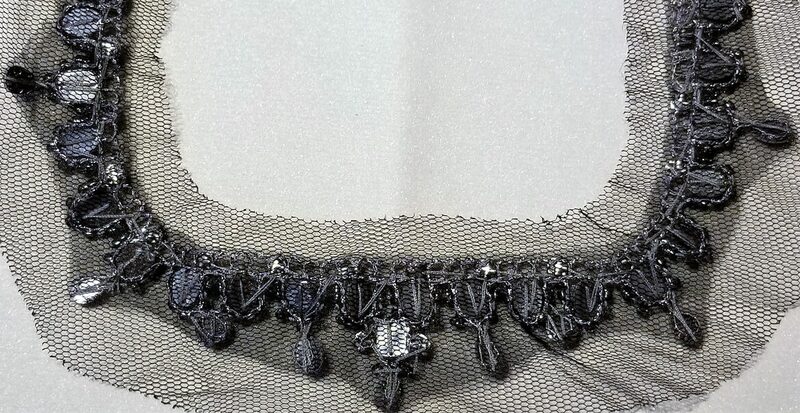 It has a background of netting for attaching to material. The back is shown in the last picture. 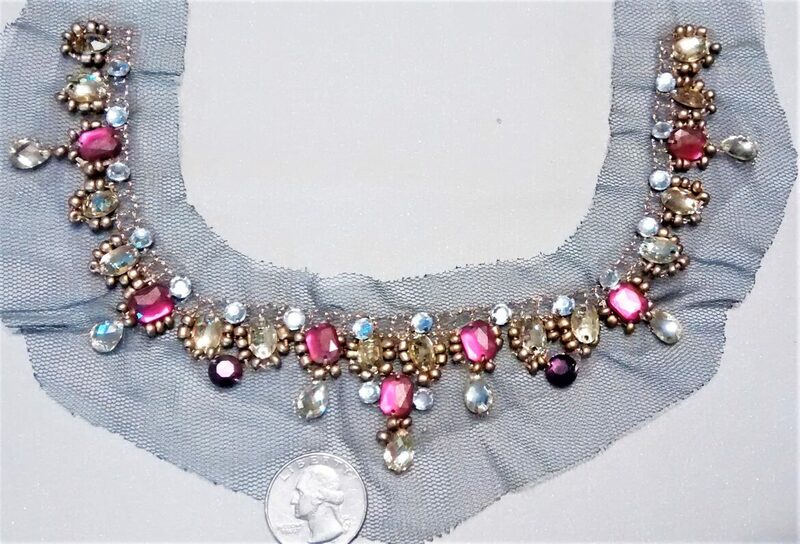 Did I mention that this is one gorgeous piece?